I popped into the thrift shop right next to my neighborhood post office only because I was at that post office. I usually don't go into this thrift store, because the prices have just gotten insane. You know how it is. You find a nice thrift shop. You become a loyal regular customer, picking up reasonably-priced items here and there for your projects, creations, and home decor and...wham! One day the people running your neighborhood thrift store decide that they are now an antique shop and start marking up anything that looks vintage to prices even the antique store wouldn't charge. I only visit thrift shops where the money goes to charity, so I shouldn't begrudge these places for wanting to make as much money as possible. But I do get tired of stupid prices in thrift shops that are above antique store prices. I spied this kitschy shade! 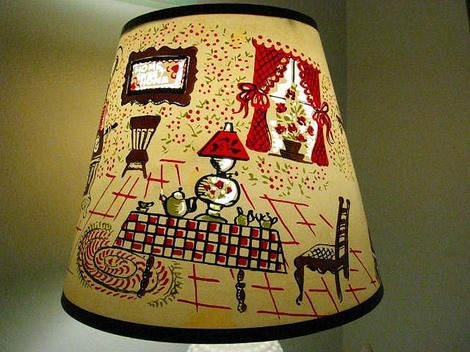 I already had the lamp in my kitchen, but the fabric shade was so hard to clean. This shade just called to me. It's silkscreened over thick clear plastic. What I love about it is the places without paint where the light can shine through. 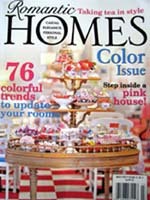 The little picture on the shade glows with "Home Sweet Home"! 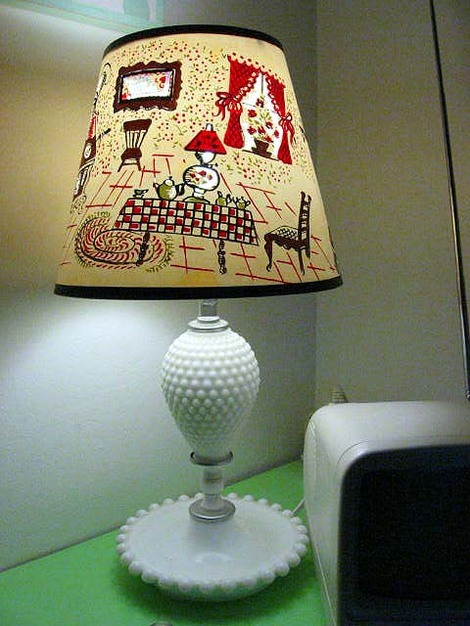 Light shines through the window and the lamp on the table too! This fun shade is perfect for our kitchen. It cost just 3 dollars! 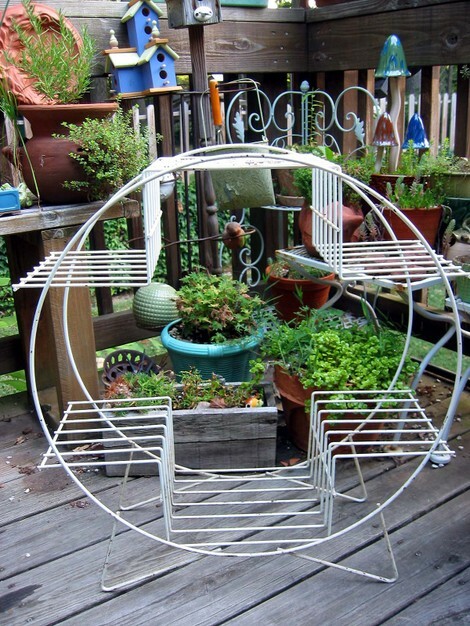 I thought that was a fair price and was very happy to pay 3 dollars for something so fun for our kitschy kitchen! We're heading down to my hometown of Richmond, Virginia for five days. 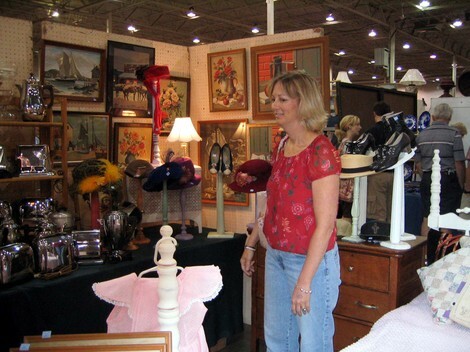 My mother and I are planning to hit all of the antique malls and thrift shops. Richmond has some wonderful shops too! I'll be sure to let you know what I find! This has been a delightful swap in the creating and the swaping! IIt was hosted by the lovely Angelina! I was paired with the most wonderful lady, Mary Ann! She is sooo talented in the paper arts! 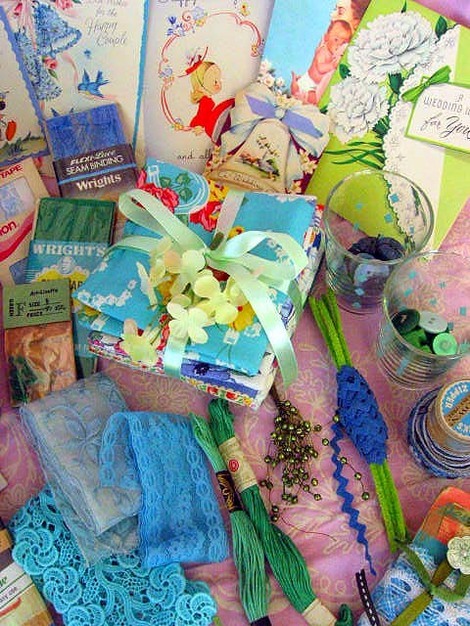 I was knocked off of my feet when MAry Ann's lovely box arrived at my doorstep! Just take a look at these fabulous creations! 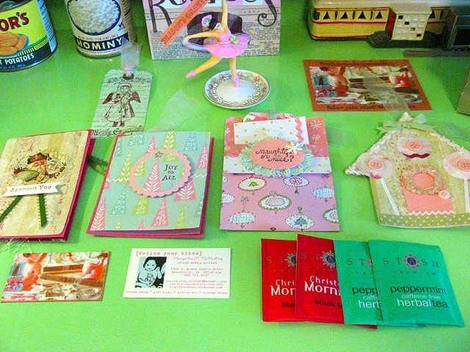 These cards are so very lovely! 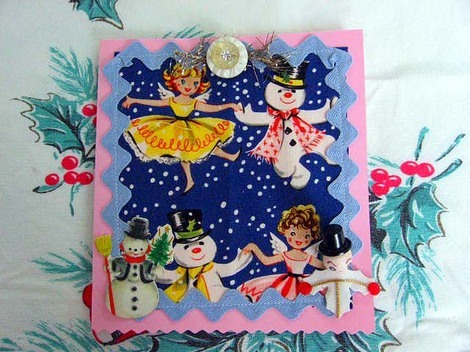 Mary Ann's stamping, cutting and embellishing is so first rate and very VERY beautiful! How could I possibly give these away for the holidays???? Tucked inside each card was a perfectly matching tag! I couldn't believe the beauty of these wee works of art! The colors are perfection! And if these lovlies weren't enough, the super generous Mary Ann slipped in a PRETTY ballering en pointe in a vintage rose dish surrounded by sparkle! This little beauty will have an honored place in my studio/office! Thanks so so much, Mary Ann! 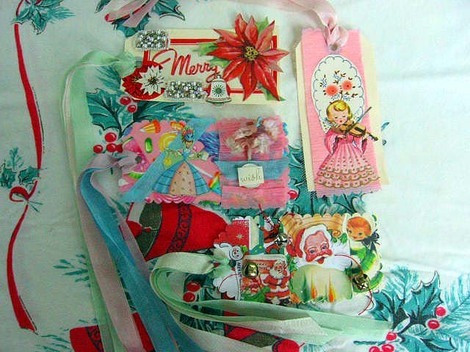 And to everyone, for wonderful creations and embellishments like these, please visit Mary Ann's fabulous etsy shop Follow Your Bliss! 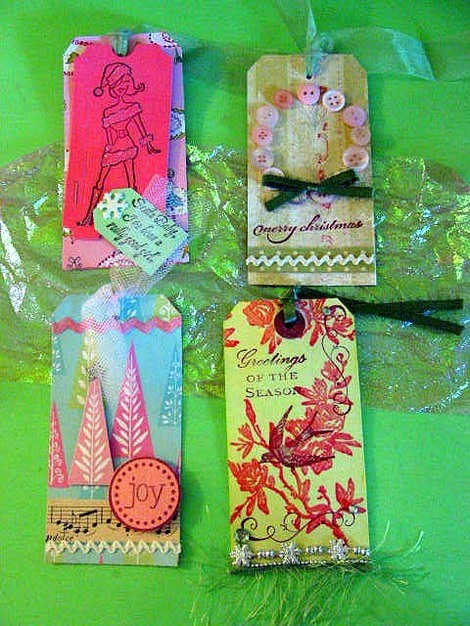 I posted BELOW the cards and tags I made for Miss Mary Ann! I certainly hope she'll like them! I had a blast creating them for her! 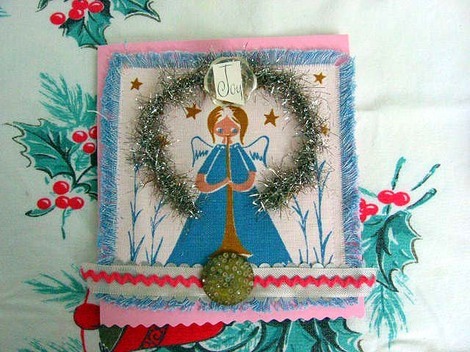 I got to rummage through my vintage Christmas card collection, vintage metal tinsel, and other sparkly vintage holiday bits and baubles to make these cards and tags just for her! It's A Wonderful Big Flea! We headed out for the Big Flea soon after! It opens at nine and there were two buildings with a total of 1100 dealers! Yay! We found several of our favorite booths right away. 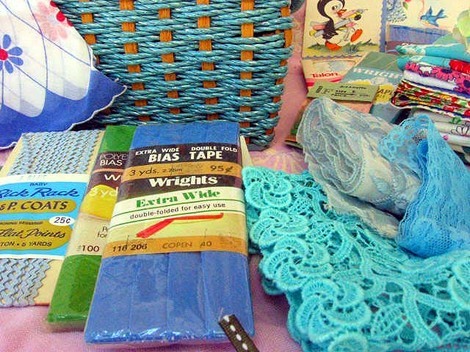 Suzy and I scanned the vast array of goodies and quickly loaded our totes with wonderful vintage sewing items. We were too distracted with buying to take a picture of that wonderful booth. Perhaps next time. I snapped a pic of Suzy in another booth nearby before anyone could tell us not to! I found a wonderful vintage Mary Poppins coloring book, but didn't buy it because I actually still own the copy my mother bought me way back in the day! I did, however, snag some fun vintage barkcloth and quilt pieces from the friendly folks at this booth! One of our vary favorite booths is run by Victoria Pramme from York, PA. Her items are fabulous and we always buy something from her! Victoria is a lot of fun and has the best eye! If you ever see Victoria when you're flea marketing on the east coast be sure to stop in! 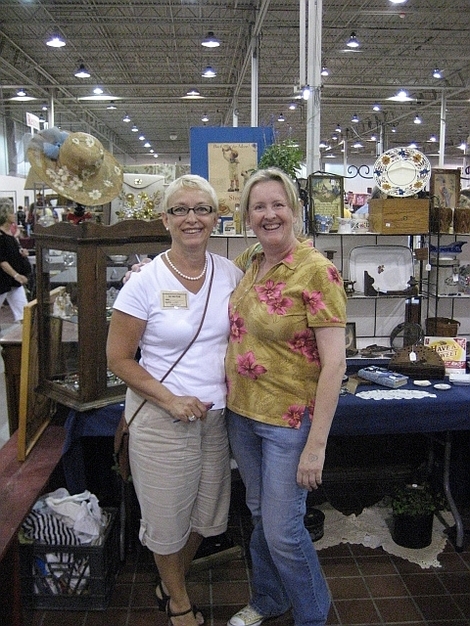 Another of our favorite stops is Ann and Linda's booth! Look how very pretty it is! 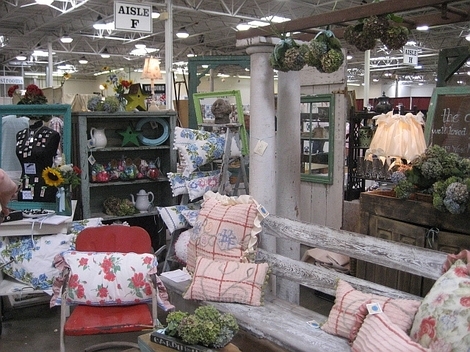 You can also find Ann and Linda's fabulous shop, The Cottage, in beautiful and historic Leesburg, VA! 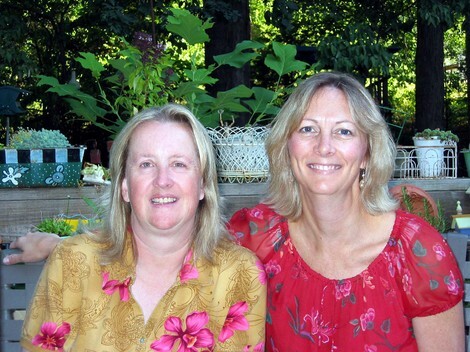 Ann and Linda invited Suzy and me to have our very first trunk show at their shop in October! We'll keep you posted! Here are some pics of what I found at the Big Flea! 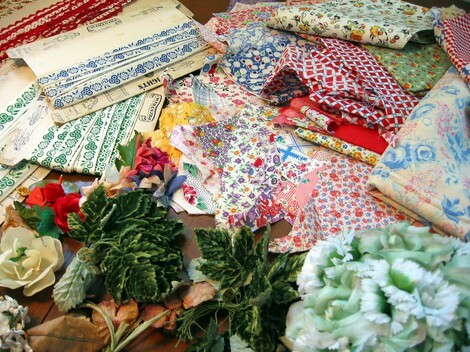 Vintage fabric scraps for pin cushions, vintage millinery flowers for corsages, and trims for lots of creations! 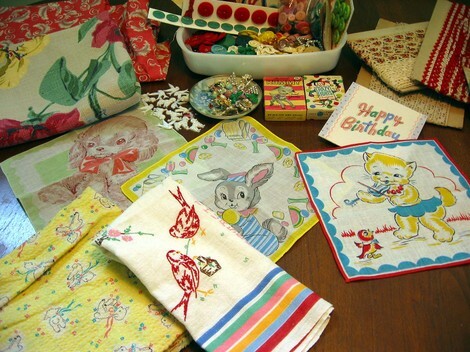 Vintage barkcloth and animal hankies to transform into tote/diaper bags! Of course, I bought LOTS of vintage buttons! I needed yellow, pink, and green ones and found them! 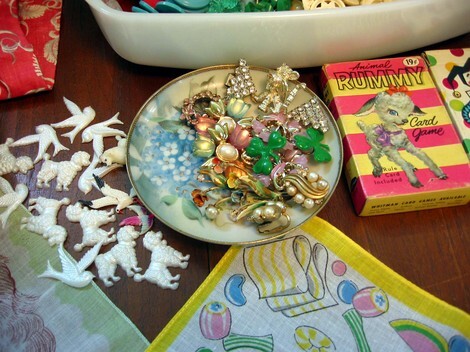 Vintage kid's playing cards with incredible graphics, vintage jewelry, bird and poodle cabuchons--oh my! And of course more vintage millinery flowers! 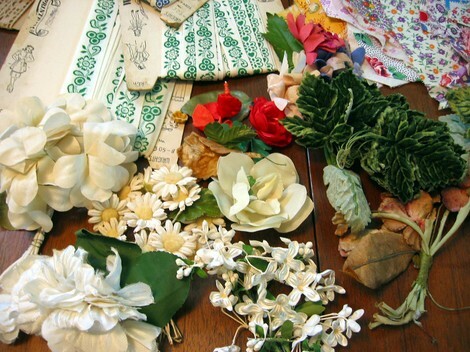 I'll use these in new vintage flower corsage/brooches I make for my etsy shop. 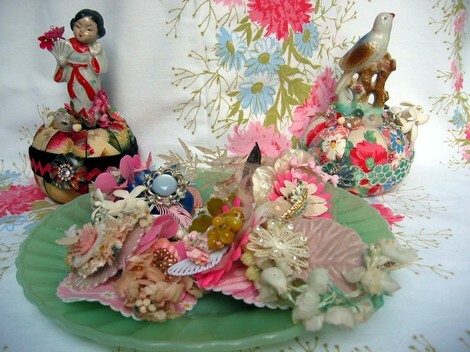 You just can't have too many vintage millinery flowers, IMHO! 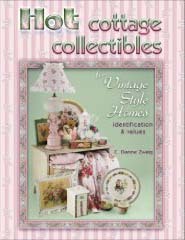 Be sure to check out Suzy's blog for her to post her fabulous finds! I hope you all had a wonderful weekend and found lots of treasures! I love swaps! I have been in several and have met some of the loveliest ladies. From the swaps, I have lovely vintage items and the most fabulolus hand-made creations from generous and talented ladies! If you haven't joined a swap please do! I don't know how I found the swaps. Usually by accident or from a recommendation by a blogland buddy. Aren't they wonderful? 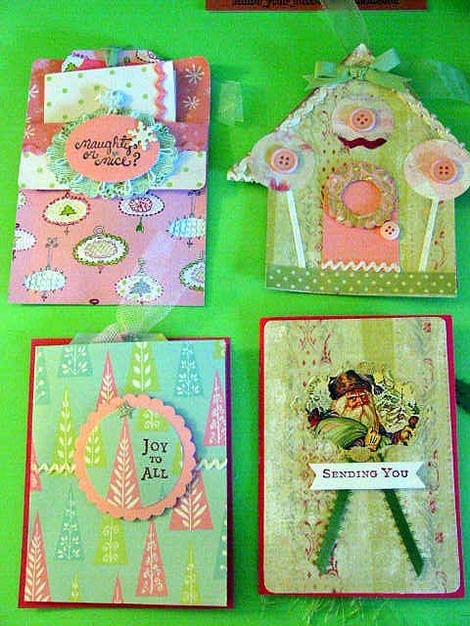 These lovely cards will have a special place in my studio! 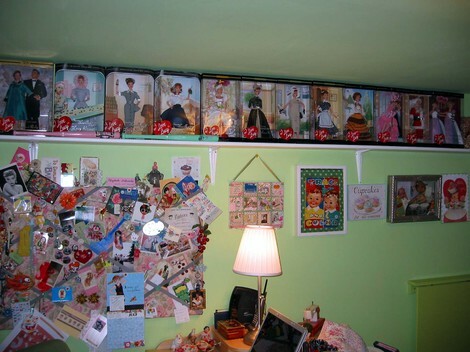 I've covered up the completed cards, because I want it to be surprise for Miss Mary Ann! This is the top of the umbrella. It is a full-size umbrella with a black cotton umbrella that opens, but it's a prop only and not waterproof. I love it! 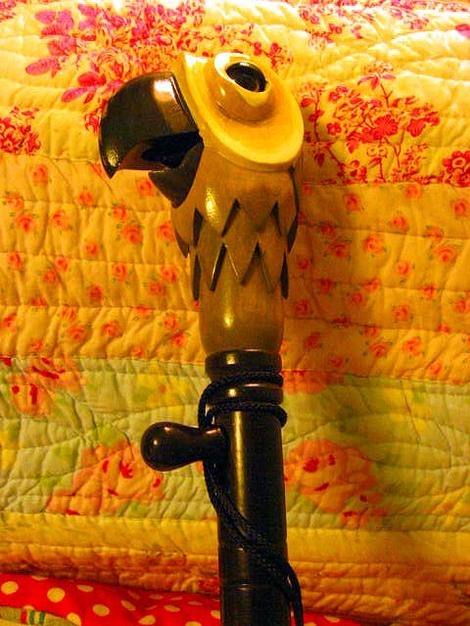 The knob beneath the parrot makes his beak open and close. OK, it's silly, but I don't care. Now, perhaps, for Halloween I can be Mary Poppins???? 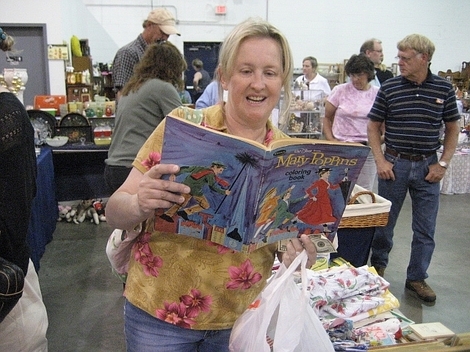 I hope everyone had a chance to shop some wonderful estate sales and garage sales like I did saturday. It was a pleasant cool morning when I arrived at the house in a nice 1960's neighborhood. A line had formed and I had to take a number. 35. Yikes! I was pretty certain I wouldn't be in the first wave of folks to enter. As I stood in line I noticed that most of the people in front of me were men. What do men buy at estate sales? My best guess is tools and anything military. On the rare occassions when hubby goes with me I can count on him being in the garage or tool shed. The estate sale "supervisor" called out the first 20 people in a gruff "I got up too early this morning" tone. After less than 5 minutes several men came out empty-handed. My spirits soared that there wasn't much "man" stuff in there and perhaps I would get lucky and finds things I needed to make my creations. After another five to ten minutes I was allowed in. 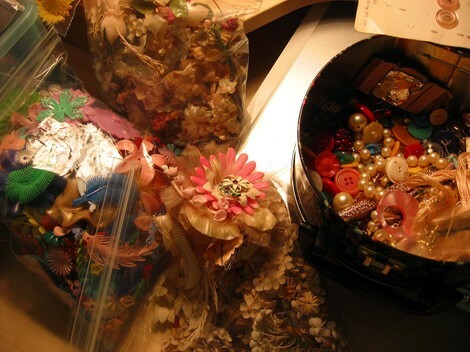 I bought a wonderful bag of "broken" vintage jewelry as well as some other earrings and brooches. Who but crafters like us buys bags of broken jewelry? It was great fun sorting through them! I wound my way into my second favorite part of an estate sale: the basement or rec room. This is where all of the cool "stuff" is located. You know what I mean. 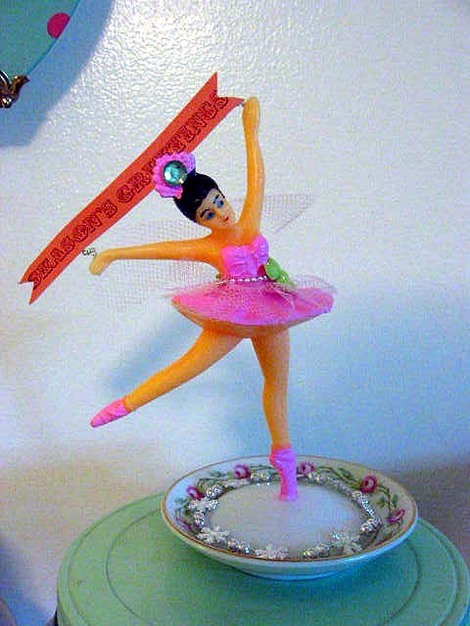 Those fun bits of ephemera, holiday ornaments, toys, etc. 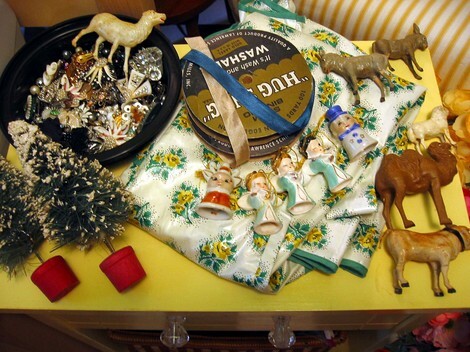 I bought a nice box of vintage Christmas ornaments for my BFF Suzy for her to use in her FABULOUS wreaths! I found some wonderful holiday ornaments to use on my future pin cushions I will offer on my etsy shop for the holiday season. The vintage nativity animals will go in my holiday display among my collection of vintage bottle brush trees. These two trees will make a wonderful addition to my bottle bru sh forest. The vintage seams binding in a wonderful taupe and teal blue AND the vintage apron were found at a local thrift store after the estate sale! 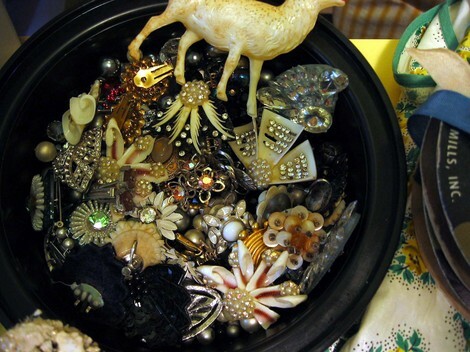 Now, one of my very favorite things to find at an estate sale are buttons! Lots of buttons! These are some of my favorites. I still have LOTS more to sort! 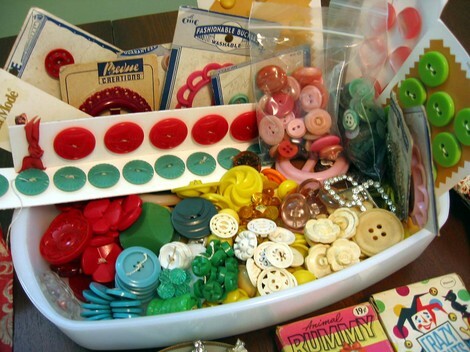 Now, that I have lots of new vintage buttons and jewelry I need to get sewing to use them up! I also need to put my latest creations on etsy Beth's Bagz. I hope everyone has a wonderful day! Let me know what you found this weekend! Good Morning!~~I love the morning in the summer. The weather doesn't drive you inside to the air conditioning yet and outside seems like it's all your own! When we went to Vermont a couple of weeks ago we visited the granite quarry in Barre. Hubby and son wanted very much to see the 600 feet hole in the ground. I had been to Barre 20 years ago and was told that the quarry I saw back then was now full of water! They have a wonderful visitor center at the Rock of Ages quarry and it includes a gift shop with things made of...you guessed it! Granite! I couldn't resist spending big bucks ($85!) on a solid granite bird house. It is hollowed out inside. It will make such a great fortress for any number of house wrens who flock to our yard. The little chimney is my favorite part. 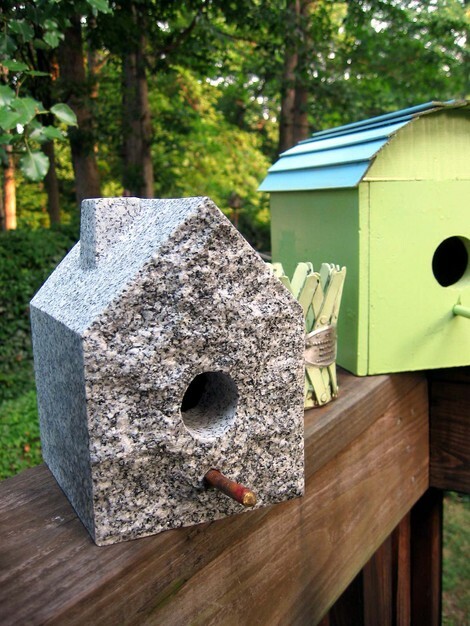 The bird house is one piece of granite and weighs a lot! I dare the squirrels to chew a hole in this bird house! On saturday I took a stroll around the block to a neighbor who was hving a yard sale. I just about sprinted to the yard when I saw this in their yard! I listed six new creations on Beth's Bagz Etsy Shop this morning. I simply love etsy. What a wonderful group of creative sellers. It is now one of my very favorite sites! I sat down this afternoon in my basement sewing studio/craft room/office hiding away from the oppressive heat and humidty that can plague the Washington, DC area in mid-summer. In my cool cavern, which has one little window at ground level, I thought I'd assemble some new vintage flower corsages. 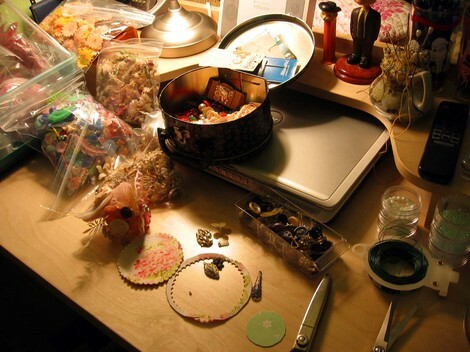 I am always interested in the work spaces of others and take great delight in seeing a busy work table from where wondrous creations will emerge. 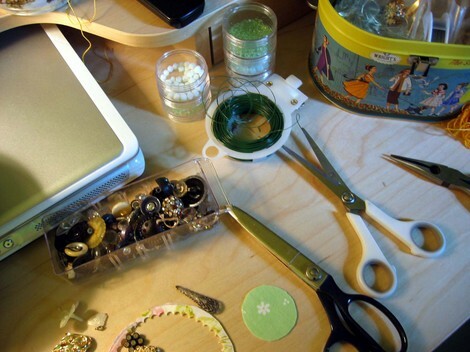 I use my desk as a worktable for small-scale projects. This is also where I use my laptop to compose fiction and this blog entry too! 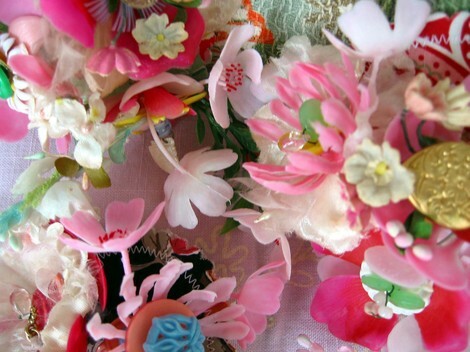 ...I try to keep the various vintage millinery and plastic flowers in plastic bags sorted by color and material. It doesn't always work out that way. One flower, newly created, sits on top of a bag. I love my hardward store plastic drawers where I keep buttons sorted by color and type. The drawers slide right out and can sit on the table. This drawer has rhinestone and luctie buttons. The large pair of Wiss scissors were owned by my Great Aunt Lucy and are scalloped-edged pinking shears. They are one of my prized posseions in my sewing/craft arsenal. My inspiration bulletin board sits to the left of my chair. And as you can see I have Jen Duncan's incredible BIts n' Piecs collage on my wall as well as Jenny's cupcakes on my office wall! This is my little piece of paradise and I have lots of Lucys and one Ricky and one Ethel looking down at me! A Lucky Winner and My Etsy Shop is Now Open! Thank you all so so much for your wonderful and supportive comments to my blog over the past week! I just love this community of creative folk! You all are THE BEST! XXOO! Now, I had my son give me a number and that was how I chose the winner of the vintage sewing give-away. She is: MadreKarin! Congrats! Please take a look at my new Beth's Bagz etsy shop by either clicking on the link or on the button to your upper right. I am offering freshly created one-of-a-kind pin cushions, totes, and flower corsages made from new and vintage materials! Thanks for stopping by! Also, don't forget to stop by the BFF Suzy's brand new esty shop GeorgiaPeachez! 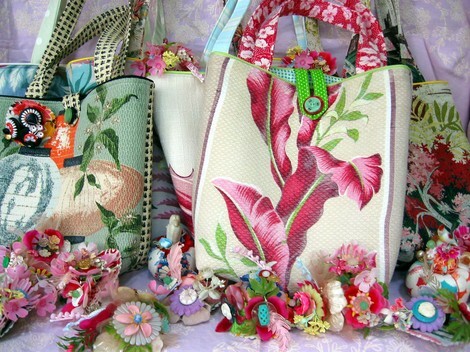 Suzy is offering wonderful totes, purses, and aprons made from new and vintage materials too! She launched her etsy shop today too! A Sneak Preview of My Upcoming Etsy Shop! On Sunday, July 8th, I'll be launching my NEW etsy shop! I am sooo excited to be offering my one-of-a-kind creations on etsy! I have been offering my creations on ebay, and will continue to do so, for eight years. But I feel that some of my new creations will be PERFECT for etsy! Here is a sneak preview of some of the things I will selling on etsy beginning Sunday, afternoon/evening July 8th! 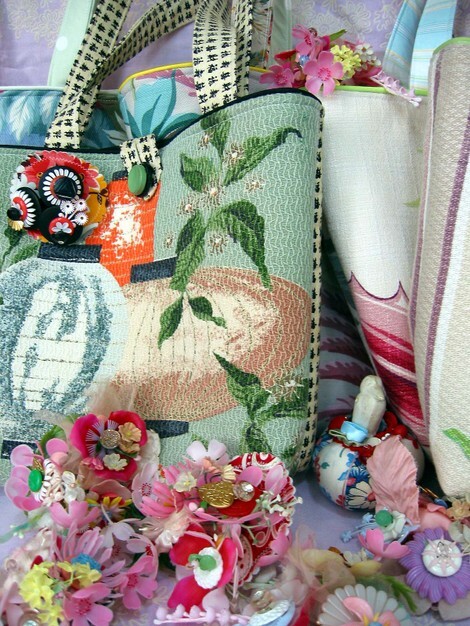 Vintage barkcloth totes, vintage flower corsages, AND pin cushions made from new and vintage fabrics with cute vintage figurines on top! 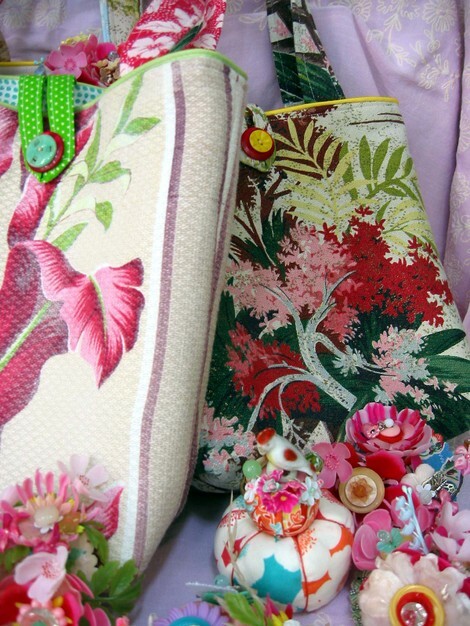 Vintage fabrics and flowers~~~OH MY! 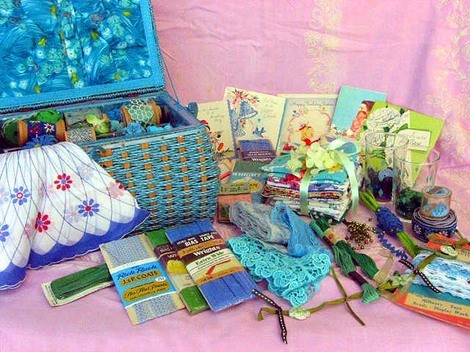 Be sure to scroll down to the pervious post and ENTER THERE for a chance to win a vintage sewing basket FULL of vintage sewing goodies and more! 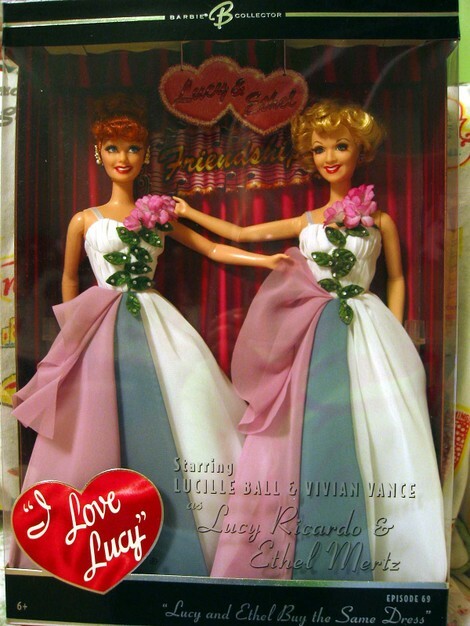 AND be sure to check out my BFF Suzy's blog to enter for her vintage sewing goodies in yellow and pink! Suzy is also launching her etsy shop on JUly 8th! 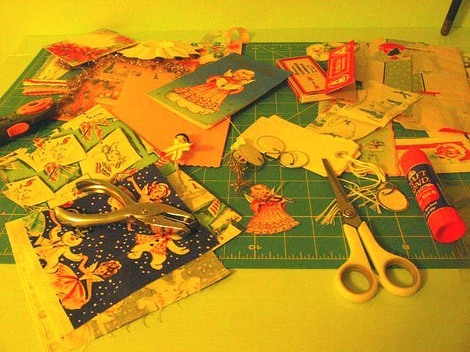 In honor of the grand opening of my new etsy shop and the etsy shop of my BFF Suzy on Sunday, July 8th, we are hosting two VINTAGE SEWING GIVE-AWAYS!!! 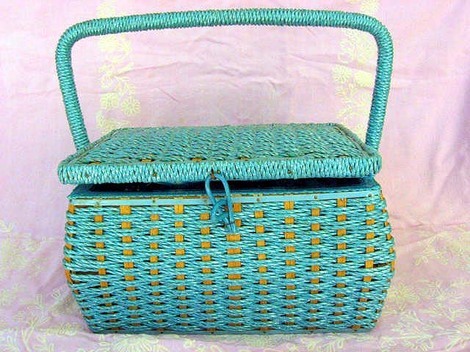 Please post a comment to THIS blog post to enter a drawing to win this fabulous aqua vintage sewing basket with goodies in green and blue! 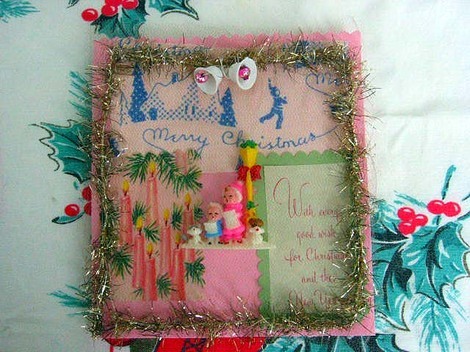 Suzy's vintage sewing give-away is PINK and YELLOW themed, so be sure to visit her blog and post a comment to be entered in the drawing for her give-away! Winners will be announced on July 8th the day of the launch of our etsy shops! 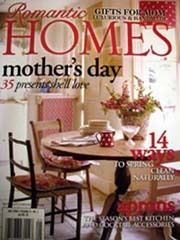 Later this week we will post a sneak preview of items from each of our esty shops! 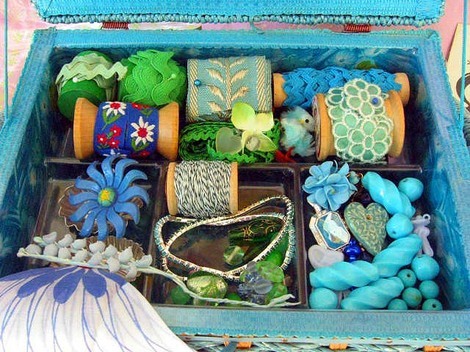 Vintage sewing items in green and blue! Some ephemera for FUN! A hankie too! Vintage trims in blue! A stack of vintage fabric scraps! Two vintage juice glasses with buttons in green and blue too! AND vintage wooden spools wrapped with vintage trims! Aqua beads! A floral curtain tie-back!